Lucent Technologies headquarters, Murray Hill, New Jersey. Reproduced by permission of Getty Images. Talking with a friend over long distances, whether by telephone, cellular phone, or computer, has never been easier thanks to the innovations developed by ancestors of Lucent Technologies. Lucent has roots reaching back to 1876, when inventors raced to build the first telephone. It started as American Bell, combined forces with Western Electric, and then finally became American Telephone & Telegraph (AT&T). In 1996, AT&T split into three separate companies: AT&T, NCR, and Lucent. Today, Lucent remains one of the leading providers of telecommunications equipment throughout the world. And, with the help of its research and development arm, Bell Labs, it continues to develop equipment that transports voice and data in record speed. Alexander Graham Bell had been working on the plans for an electric telephone for several years when he submitted his designs to the United States Patent Office in January 1876. On the very same day, just a few hours later, another inventor, Elisha Gray (1835-1901), also submitted a patent application for an electric telephone. Gray was cofounder of the Western Electric Manufacturing Company, known for producing electrical equipment, typewriters, and telegraph equipment. Although Gray had been awarded seventy patents throughout his lifetime, he lost the race to become the inventor of the telephone. Alexander Graham Bell was issued the first telephone patent, No. 174,465, on March 7, 1876. After many experiments, Bell and his laboratory assistant, Thomas A. Watson (1854-1934), sent the first message using a telephone. On March 10, 1876, while Bell was in one room and Watson in another in their shop on Court Street in Boston, Massachusetts, Bell accidentally spilled a chemical and spoke the famous words, "Watson, please come here. I want you." This was the first time a complete understandable sentence was transmitted by electrical impulses through a wire. Over the following two decades, the company responsible for developing and manufacturing telephone equipment went through several changes. In 1877, Bell, along with Watson and two other partners, formed the Bell Telephone Company. They purchased a controlling interest in Elisha Gray's Western Electric Company in 1881. In 1899, Bell changed his company's name to American Telephone & Telegraph (AT&T). In 1907, Theodore N. Vail, a former employee of the Western Union Telegraph Company, became president of AT&T and combined the Western Electric and AT&T engineering departments to form what would later be known as Bell Telephone Laboratories. For most of the twentieth century, AT&T went through a series of name changes, company purchases, and breakups that would eventually lead to Lucent Technologies. Until the 1980s, AT&T had been a monopoly, which means it had exclusive control of manufacturing phone equipment and long-distance telephone lines in the United States. After it refused to lease lines to long-distance companies like MCI, the United States Justice Department forced AT&T to break up into seven regional phone companies, known as "Baby Bells," in 1984. Alexander Graham Bell receives the first telephone patent. Bell Telephone Company is formed. Bell purchases a controlling interest in Western Electric Company. Bell changes company name to American Telephone & Telegraph (AT&T). Thomas N. Vail becomes president of AT&T and Bell Labs is formed. Bell Lab scientist receives first of eleven Bell Labs Nobel Prizes. Bell Labs invents the transistor. Bell Labs invents the laser. AT&T divides into seven regional phone companies called "Baby Bells." AT&T splits into three companies and Lucent is born. Henry Schact is CEO. Richard McGinn is hired as Lucent's CEO. Lucent's initial public offering earns a record $3 billion. Lucent experiences a drop in stock price and revenue; company lays off thousands of employees. Patricia F. Russo becomes president and CEO of Lucent. Ten years later, the United States government deregulated, or removed restrictions from, the telecommunications industry. This means that AT&T finally had some competition. The company wanted to stay ahead of this new competition, so in 1996, they divided their corporation into three separate companies: NCR Corporation made large computers; a new AT&T provided long-distance, wireless, and credit card services; and Lucent Technologies made telephones, network switching equipment, and computer chips. 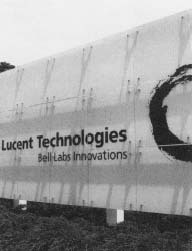 Lucent also acquired most of Bell Laboratories. Since 1925, scientists at Bell Labs have been credited with more than forty thousand inventions. In addition to telephone technology, Bell Labs provided Hollywood with the practical means to add sound to silent movies, and made communications and command equipment for the United States military during World War II (1939-45). In 1947, three Bell Labs scientists received the Nobel Prize for their invention of the revolutionary transistor, an electronic device used to control the flow of electricity. Bell Labs devised the transistor to replace manual telephone exchange switches with automatic electronic switches. Before this, in order to telephone a friend, a person had to call an operator who placed the call for them using flexible cords that plugged into the correct socket, or jack, on a switchboard. So, in effect, the operator controlled the flow. The new technology also amplified long distance signals. Today, transistors exist within nearly all electronic devices such as computers, video cameras, CD players, remote controls, and cell phones. In 1877, when Bell Telephone was established, there were 3,000 telephones in American homes; in 1900, the number of phones rose to 1.4 million. By the end of the twentieth century, there were phones in more than 100 million households nationwide. Bell Labs continued to develop many more technological firsts. In 1958, Arthur L. Schawlow (1921-1999), a Bell Labs researcher, and Charles H. Townes (1915-), a consultant to Bell Labs, made history when they invented the laser. Originally known by the acronym LASER, meaning Light Amplification by Stimulated Emission of Radiation, billions of these intense beams of light are at work every day in areas such as manufacturing, construction, and medicine. In telecommunications, lasers transmit voice, data, and video through tiny strands of encased glass called fiber optic waveguides. For example, when an item is purchased at a grocery store it is scanned by a laser. The information from its bar code, including the price, is transmitted to the computerized cash register. Beginning in the 1960s, transmitting information using computers became increasingly important. In response, Bell Labs scientists developed UNIX, a computer operating system that played a major role in the early days of the Internet. And, more recently, to support the billions of phone calls and the l90 billion e-mail messages sent each year, Bell Labs developed technology to provide efficient and rapid movement of voice and data. In 2002, with sixteen thousand employees working in sixteen countries around the world, Bell Labs continues to make amazing advancements in telecommunications. For example, they are developing the world's first functional transistor that is only one molecule thick. Early transistors were about the size of a lightbulb, and actually looked like a lightbulb, with glass surrounding a metal filament. If new transistors are one molecule thick, it means that they are much thinner than a piece of paper. When AT&T split into three companies in 1996, Lucent was the biggest corporate spin-off in American history. Lucent completed an initial public offering (IPO) by selling stock in itself for the first time. Sales of this stock raised $3 billion. The company was off and running, and many investors and financial specialists predicted a bright future. Henry Schact, a fifteen-year AT&T board member, was chosen to lead the way as Lucent's first chief executive officer (CEO). The word lucent dates back to the fifteenth century and means "glowing light." Lander Associates, a San Francisco design firm, came up with the name to describe the company's clarity of thought, purpose, and vision. Lucent's logo, a red, sketched circle, is called "the innovation ring." For the next three years, Lucent purchased and merged with several other companies to expand their products and services. Some of the larger transactions included their $20 billion acquisition of Ascend Communications, an independent Internet supplier, and a $3.7 billion merger with service specialist International Network Services. In a 1999 New York Times article, Robert Rich of the Yankee Group, a technology research company in Boston, said "If you are looking for one-stop shopping, Lucent will have more arrows in its quiver than anyone else." The company enjoyed steady growth until 1999 when the number of employees reached 153,000, and Lucent stockholders benefited from stock prices at $77 a share, an enormous increase from $7 a share at its IPO. Lucent Techno Speak: What Does It All Mean? Communications networking equipment: A communications network is a system of computers, terminals, and other devices that are interconnected. Lucent makes the hardware and software that lets the parts of the system speak to each other, or exchange data. For example, counselors in a school use networked computers to share information about student schedules. Internet service provider (ISP): An ISP is a company that consumers and businesses go to for their Internet service. Lucent develops the infrastructure, or the electronic system, that helps ISPs provide Internet service. Examples of ISPs are American Online, Microsoft Network (MSN), and Comcast. Optical network: Lucent develops optical networks, which carry digitized voice or data at very high speed on multiple channels of light. Optical networks are used in Internet, video, and multimedia technology. For instance, cable television is now distributed to homes through optical networks. One result is that you can get hundreds of TV channels to surf through. Wireless network: Lucent creates networks that allow wireless devices to talk to each other. Wireless devices include cellular phones and pagers. Soon, however, good times began to turn bad. "The company got off to a fast start selling equipment like switches that help carriers connect telephone calls to traditional phone companies like its former parent," said Kevin Peraino in a 2000 Newsweek article. The problem was, Perano went on to say, that Lucent did not keep up with the times. It did not focus enough on Internet technology. At the time the article was printed, Lucent's stock had dropped more than 70 percent. A microscopic view of a tiny microphone on a computer chip being developed by researchers at Lucent Technologies's Bell Laboratories in Murray Hill, New Jersey. 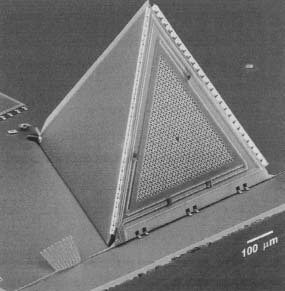 The tiny pyramid-shaped microphone could lead to radio communicators the size of a wristwatch. In 1997, Richard McGinn, an AT&T salesman since the 1960s, replaced Schact as CEO and chairman of Lucent. When the company began to take a downturn in 2000, Schact replaced McGinn and returned to serve as Lucent's temporary boss until a permanent replacement was found. Schact said in a 2000 Wall Street Journal article, "We are looking at 2001 as a transition and rebuilding year for Lucent." But its problems only got worse. By January 2002, over sixty thousand Lucent employees had been laid off, and its stock was sold at $6.94. It was time for a new leader. On January 7, 2002, a 49-year-old resident of Trenton, New Jersey, and twenty-year company employee, Patricia F. Russo, became Lucent's new CEO, while Schact remained as chairman. "We've built a plan that is solid, credible and broad-based. And we're going to restore this company to the luster it once had," Russo told the authors of a Wall Street Journal article on January 8, 2002. Lucent files an average of four patent applications each workday and has received twenty-eight thousand patents since 1925. Bell Labs researchers have been awarded eleven Nobel Prizes, with the first going to Clinton J. Davisson (1881-1958) in 1937, for his experiments on the wave nature of electrons. Skeptics questioned Lucent's ability to bounce back unless the company's and Russo's goals stayed focused on what it does best: producing equipment for large telecommunications companies like AT&T and Verizon. David Toung, a telecommunications equipment analyst, said in a January 8, 2002, article in a Bergen County, New Jersey, newspaper, The Record, "I think this company will ride the telecom market and when the telecom market comes back, they will come back."